Local authorities are required by law to identify local air quality problems and to take action to tackle them. Air quality has generally improved significantly in recent decades. Since 1970 sulphur dioxide emissions have decreased by 95%, particulate matter by 73%, and nitrogen oxides by 69%. Total UK emissions of nitrogen oxides (NOx) fell by a further 19% between 2010 and 2015. However, poor air quality persists in certain areas of the country and continues to affect human health and our environment. The Government published the UK’s plan for reducing roadside nitrogen dioxide concentrations in May 2017, setting out its approach to meeting the statutory limits for nitrogen dioxide (NO₂). In 2019, the Government published a Clean Air Strategy following public consultation on a draft in 2018. The strategy outlines how the Government aims to tackle all sources of air pollution, making our air healthier to breathe, protecting nature and boosting the economy. Local authorities are responsible for managing air quality, working with local stakeholders. We review and assess air quality in our area to determine whether we are likely to achieve the targets set out by Government. If we think we will not meet a target, we have to declare an Air Quality Management Area (AQMA) covering the part of the borough where the problem lies. We must then draw up an air quality action plan stating how we will aim to meet the targets, consulting neighbouring local authorities, businesses, local people, the Highways Agency, the Environment Agency and others. 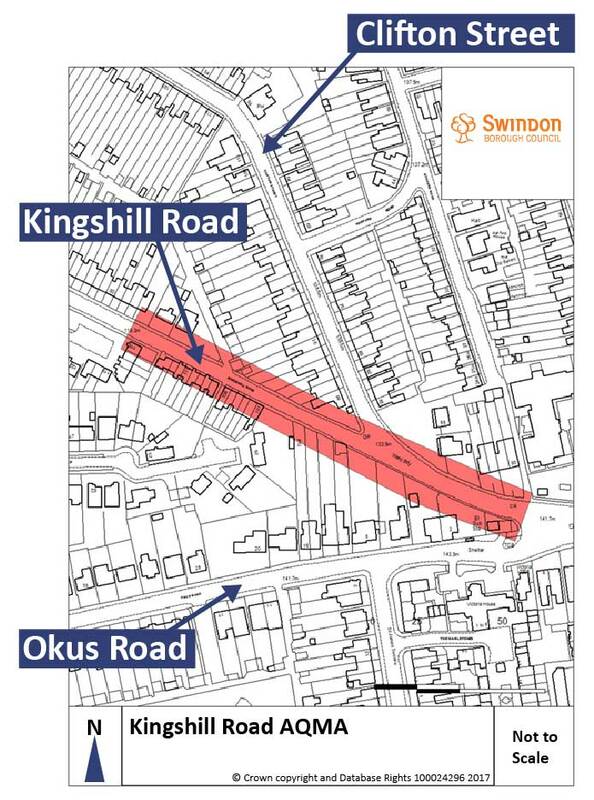 In a paper agreed by Swindon Borough Council’s Cabinet in February 2018, Kingshill Road area was declared an Air Quality Management Area (AQMA). This was because regular monitoring of Nitrogen Dioxide (NO₂) in this location, the most common pollutant, indicates that this location is currently in breach of the annual average air quality objective of 40μg/m3. The Council issued a media release on 2 February 2018. An Air Quality Management Steering Group has been established to develop and oversee the implementation of the Air Quality Action Plan for Swindon along with working to improve air quality across the borough. The Council will formally consult on a draft Action Plan by the end of 2018. To inform the development of the draft Action Plan, the Council organised a public meeting on 19 September 2018 for local residents to find out more and share their ideas. The Council formally consulted on a draft Action Plan between 21 December 2018 and 3 February 2019. The updated draft Action Plan, updated following that public consultation, will be reviewed at the March 2019 meeting of the Council’s Cabinet. You can read the accompanying Cabinet Paper here. Over half of all local authorities in England have declared AQMAs. This interactive map shows where they are across the UK and which local authorities have declared AQMAs. If you would like further information about the work of the Air Quality Management Steering Group, or if you have a suggestion for the group please contact airquality@swindon.gov.uk. You can report an issue with air quality in Swindon via the tell us about an air quality problem webpage.